Sunshine is delicious, rain is refreshing, wind braces us up, snow is exhilarating; there is really no such thing as bad weather, inky different kinds of good weather. ​Right about now, the middle to end of March, I begin to feel the heaviness. The clouds are fat with moisture, lumbering across a grey sky. When the sky is blue, the air is wintry cold. yesterday was grey, but I didn’t wear a jacket. I did, however have on my snood and gloves. That was enough to trick my body into thinking it was warmer than it was. It’s not just the weather that’s heavy. Things are picking up for school assignments. Drama club has finally ended, but it’s been replaced by notes to parents for help on those end of year assignments, and how can it be the end of the year already? There’s Easter upcoming, full weekends, bills to pay, taxes to do, and nowhere to escape. I’ve kept busy with my kids, our weekly television viewing, a church breakfast, reading Chernow’s Grant, tagging along to find The Lost Book of Moses, two days of reflection that were everything I’d hoped they would be, and more, and still not enough. One or two times a year I try to give myself a retreat. A self-guided retreat, some planned out and some spontaneous, encompassing both spiritual and writerly things and if I’m lucky a tiny bit of travel, too. I am lucky this weekend to be heading out on a spiritual-slash-writing retreat and I hope to bookend the weekend with two days of my own guidance. If you don’t have a retreat center nearby, I would highly recommend giving yourself a self-retreat. Begin by blocking out a few days in a row. I would suggest a minimum of three days. If that’s not possible, try and arrange your regular work days off to be two consecutive days. Choose a theme. What are you trying to get out of this time “away”? Are you looking to get something done? Are you looking to get nothing done? Quiet time? Or contemplation? Meditation and prayer? Silence and solitude? Will you bring music along? Will you bring food or eat out? Will you return home at times or is one of the objects to get away from home except for sleeping? Be flexible, but plan your itinerary. You don’t want to spend most of your limited time trying to figure out what to do. Have a map and/or a GPS. Have a fully charged cell phone and keep the charger in your car in case you run out of battery power. Even if you don’t normally use one, bring a journal. You can record where you went, the weather, what you saw, what you ate, what stood out to you, what you were thinking. If you draw, bring a sketchbook and a pencil. Dress in layers and bring a sweater or shawl. Wherever you are, you will either be too hot or too cold, I guarantee it. Unless your phone functions as one, bring a camera. Looking at pictures later can highlight a memory. Most importantly, know what you hope to get out of it before you go. For awhile last year, I would take myself out to lunch once a month to “write”, and after awhile, it was rote, and I was getting nothing new out of it; nothing helpful. This kind of self-retreat is a good way to jump-start your creativity, your motivation, but also to jump-start your SELF. No longer does March come in like a lion and out like a lamb. It is just as likely to come in like a lamb and go out like a a lion. What is happening with our climate and climate changes? Back in 1997, my son was born on March 21st. He had to stay in the hospital for a little less than two weeks, but while he was there, during the first week in April, we had what amounted to a blizzard. In April? Last week in upstate New York it was seventy degrees. Two days ago it was fourteen. Today it is thirty-five. The sun is shining, the sky is blue after two days of rain, freezing rain and snow. I wear my capri pants year round now. 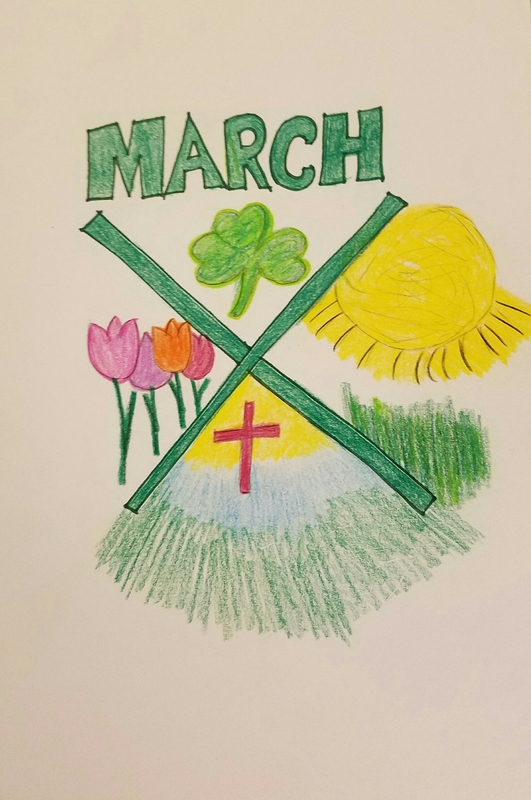 But despite the wind, the rain, the leftover snow, and of course, mud season, we think of March as green. It really isn’t, but it still has that perception. I think St. Patrick’s Day has a hand in that. We’re also wearing our bright colors before we have to don our duller and sullen Good Friday wear. Even for non-Christians, the feelings are there: attempted brightness and joy until we look outside and see the mud, the carnage in the snow. Right now, my backyard looks like a Bil Keane cartoon. But after a couple of weeks of forgetting that February is over, and with the wind dying down, we plan our gardens, we don our green apparel, we prepare our palms and our matzo, and at the end of our holidays and feasts and prayers, we remember that spring always follows winter, and in twenty more days, we will have spring and I will have a twenty-one year old. The climate may change, and we need to change with it, but the seasons will set their own agenda, and they will arrive like clockwork. Blustery to green in twenty-one days. Start: Washington D.C., North of Washington Monument, Constitution Avenue NW between 15th and 17th street. 10:00am: Main stage rally program begins. 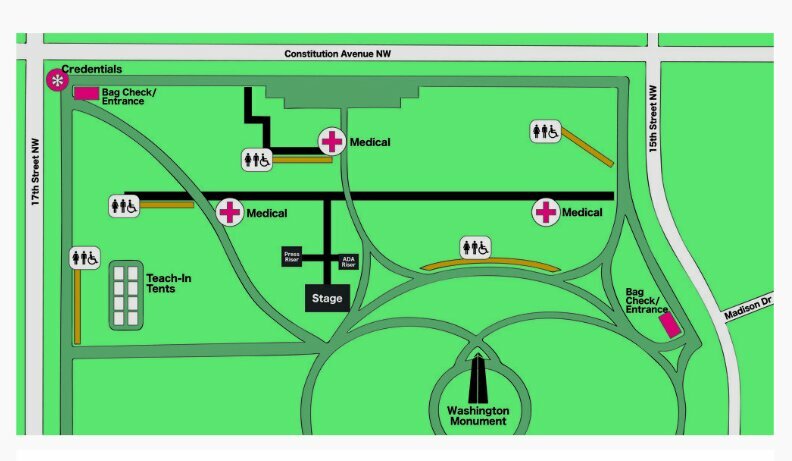 The Route – The march will form on the Washington Monument Grounds and proceed over the following route: starting at 15th and Constitution Avenue NW and proceed east on Constitution Avenue NW to 3rd Street NW, south on 3rd Street NW into Union Square where the group will disperse. Satellite Marches – Find one in your area!